I'm back on the Beach. This is right in the middle of the hotel zone on the Strip. When we had all the Spring Breakers here, this was where they were heading. At least early, later on they'd make their way south a little bit to the bars. Now, its been Disneyfied and "cleaned up". But its an interesting spot. Most of South Florida is built on top of swamp land or coral rock. It exploded after World War II and pushed most of the natural life aside. 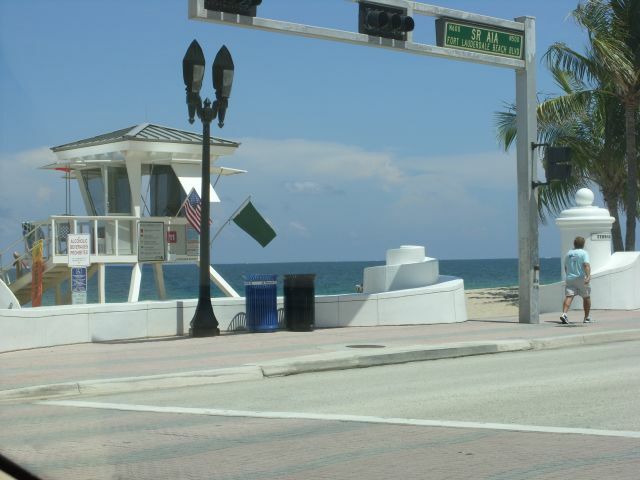 Fort Lauderdale is for the most part an artificial and man-created environment. Spots where you would sun your buns and look for a beer or six afterwords were places where nesting sea birds and sea turtles would come every year. The sea turtles liked to come ashore in nesting season, dig holes in the sand like so many other tourists, lay their eggs and then leave. Pretty similar to the snowbirds in the winter. The problem was that when we put up all these buildings the turtles would get dazzled by the lights and wander onto A1A and become turtle soup. When the people here began to get more ecologically aware, they realized that there were some simple things that we could do to make things easy for the turtles. In that picture, you see a street light pole. The lights look like someone draped a hoodie over top of the lamps. That's done by design. 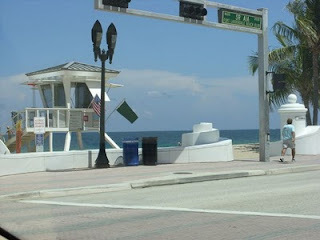 The lights are shielded to block the light from them shining on the beach behind them. The turtles coming ashore would not see the light and be able to do what they came there for. During that season, the lights on the building that face the beach are turned down as well. The neon glare of humanity is quieter for a while like a child that has been told to go to their room. It is a small thing to do so we can coexist with a little bit of nature.